A method of construction that dates back to several centuries ago, but that came from the stone age antiquity, can help to tackle some problems arising for economic construction in developing countries. In the department of Murge, Apulia, the art of dry stone construction has evolved since prehistoric times, to give rise to the type of the trulli (from the Greek word "trullos" = Dome). The plant of rooms covered with this technique can be round or square. The cover consists of a cone-shaped cupola, whose base circumference often reaches 18 meters (the radius being about three metres). The construction relies on massive walls of dry stone (80 cm thick, but can sometimes reach two metres). Retaining walls can be slightly tilted escarpment on the outside. The stone ensures not only a significant static resistance, but also a comfortable thermal inertia, in every season, and the height of the dome assures a considerable reserve of air. A perforated top, fireplace with its suction effect, is able to improve ventilation and to further improve thermal comfort. The slabs of limestone used for the coverage of the trullo are usually 3/5 cm (1”-2”) thick and are called “chianche” or “chiancarelle”. A traditional stye in Wales, shaped like a “trullo”. "The central trullo bears another smaller, more often a square floor plan, also covered with the same building system. In the great thickness of the walls are obtained alcoves for the bed, niches for furniture, hearths for kitchens, services, communication for openings between their environments and with the outside world. The construction method practiced today by Apulian farmers is one of the oldest known by humanity, in the stony countries, and held the place of prehistoric conical huts... The stony material wealth, comfort building without mortar or ribs in a country where the timber was always quite rare, have resulted in the continuation of a millenarian tradition". The necessary material, limestone is found on the site: it is roughly squared blocks of walls and base in split, carefully worked to get the subtle chianche roof. At the top of the wall, some courses of stones more regular form support plan coverage. Openings (doors and Windows) are often covered by monolithic lintels. Begin then the rings of the cupola, made of thin stone courses and protruding slightly sloped gradually toward the center of the building, so that leaning to each other, rise in increasingly narrow rings, conical shape, until a large cone-shaped stone, which serves to close top cover. "The stones of a contrasting layer between their sides creating a annular rigid system virtually and the subsequent rings they lean to the underlying layer, gradually reduced in diameter, until you reach a minimum opening is closed with a heavy stone for Keystone. In this way the circular environment remains covered by a false dome-shaped conical built without armor and without mortar that holds firmly to the side and contrasts for gravity "(from the Enciclopedia Treccani). The trullo is covered externally with regular stones (chianche) arranged almost like tiles, to facilitate the flow of rainwater. Sometimes, between the inner cover Cone (structure) and the finish coat, you should fill with pebbles conveyances that tend to form, due to some geometrical irregularities in construction. Other finishes are not necessary, because this type of coverage provides enough water resistance. The jutting stones, construction that underlies the typology of the trulli (e dei nuraghi), corresponds to the stadium more structural, similar to the primitive hut of branches and leaves: stems from a shelter housed inside of a heap of stones, in the Hollows that remain open in a more or less natural. Is a type of building found throughout the Mediterranean area and finds herself until North of Syria and the British Isles, but also on the plateaux of the African Great Lakes and in Zimbabwe and, in American territory, at the Pueblos and the Incas. Unlike arches and vaults, structures in the overhang, the trulli do not transmit forcings with horizontal components, either inside or on the ground; on the other hand, the individual elements (stone ashlars or artificial blocks) must resist a shear stress, while the ashlars of a span shall be subject only to an effort of compression (or buckling). 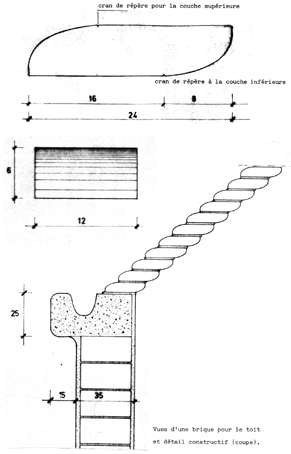 Therefore a trullo cannot be constructed with materials not suitable to support a shear stress, such as raw clay. To build a trullo enough that Mason, during installation, targets a stake placed vertically in the center of the compartment cover. Cradlings are not required to support the cone of ongoing coverage and do not need sophisticated tools, even a compass, which is necessary for the simple style semicircular vaults of the Byzantine tradition. Just the tools of everyday life of the peasant society. It's not even necessary to use, but only if you wish, complete with the application of an internal-external plaster to the walls, and cover. The technical simplicity allows residents to participate directly in the work, according to traditional ways of pre-industrial societies. We must, of course, a specialized technical direction that controls the layout of the elements. The projects of "improved trulli" made in Dakar, by arch. Fabricio Pedroza. The trulli have an optimum adaptation to climatic conditions, because the great mass of the construction and the materials used provide a strong thermal inertia. The custom of painting the exteriors with lime enhances the reflection of solar radiation. Comfort is enhanced by good ventilation, guaranteed by the “chimney effect", due to the conical section and a certain permeability of dry walls built, which allow air to seep between the stones. The trulli have risked to succumb to socio-productive changes that have marked the end of the rural society. Today they are mostly a reminder for tourists like "monuments of folklore". However, the idea of ensuring a stable roof through the use of local materials and poor technology has progressed, in the framework of plans for the development of emerging countries. Where there is not the stone between the local materials, the use of fired clay bricks and stabilized earth allowed a modern recovery of ancient construction technique of trulli, to improve the characteristics of traditional huts without recourse to corrugated roofs, that involve multiple disadvantages, especially in terms of conditioning environments. At the end of the Seventies, in Angola, the Brazilian architect Fabricio Pedroza thought to retrieve the technique of trulli to build classrooms. For the cover, he used a single layer of hollow bricks, a lightweight and durable material, as well as abundant in the country. The interior spaces were quite similar to those of traditional huts, but with all the advantages of stable materials and of a construction with excellent air conditioning (during the cool season, it was even necessary to close a good portion of the brick holes to reduce the stack effect). To achieve the required size, the classrooms were composed of a central octagon, more large, with four small trulli supported, in order to obtain a more or less square. The first experience was revived and improved over the following years, with a major educational buildings programme launched in Senegal by BREDA (Bureau Régional pour l'Education au Développement en Afrique) by UNESCO and directed by the same Pedroza and simultaneously with the realization of experimental construction in the Republic of Cape Verde. In Dakar, capital of Senegal, it was an experimental complex with roofs made of cement-sand blocks, with a specially designed shape. The larger room was circular, ruled by eight pillars around the perimeter, and it reached a diameter of 7.20 m. Housing typologies were made with rectangular and hexagonal plants. In particular, the experimental site, performed in the years 1982-84, allowed a series of verifications concerning ways of lighting and ventilation, as well as the improvement of materials, especially regarding the painting of concrete surface with oily substances. In Senegal, in the years 1984-86, UNESCO established, on the basis of that experience, a school complex in Bakel, Department of Matam, and the non-governmental organisation (NGO) ENDA-Tiers Monde entrusted to Pedroza was appointed for the construction of a multi-purpose health centre in Malicounda, in the region of Kaolack. In Cape Verde Islands Luís Araujo, a former collaborator of Pedroza, built some trulli in the town of Tarrafal, for a cooperative. Lytic material here was abundant and in fact he could use two types of stone: a more compact and massive for the walls, another, more porous and light, for the covers. In 1986, also in Cape Verde, near Tarrafal, the Italian NGO “Africa ' 70" built some parts of a tourist complex with a hexagonal plant, covered in trullo. The roof made of bricks or blocks ensures a good resistance and stability, and a little necessity of maintenance. It protects well from rainwater, especially if it is treated with oily or greasy substances, such as the milk of lime or a simple oil paint, in order to reduce absorption. In the experience of Dakar the shape of bricks, tossed with a special mold, is designed with rounded edges, to facilitate the production and laying, make lighter imposing mass of coverage and at the same time improve the aesthetic effect. In addition, the inclusion of empty bottles within the roof courses allowed special lighting effects, very decorative. A group of traditional Apulian trulli in the Murge highlands. The ease of implementation of the false cupolas enables broad participation by the population to construction work, under the direction of a few real masons teams with experience. In all cases it produced a spontaneous type of construction, due to the same workers who were formed by the experimental workshops, and then put their skills to the service of friends and acquaintances. It was also interesting to see the variation of the forms: from trulli near perfect conical, made in the workshop of Dakar, they passed away to a more approximate geometry. The same phenomenon occurred for the domes designed and constructed by ADAUA in Mauritania, in the city of Rosso, between the late Seventies and mid Eighties. In Somalia, in 1988-90, a compound of trulli was created near Mogadishu, as headquarters of the NGO Water for life (with the direction of the author of these notes). In this case, the organisation of the constructions allowed also to provide for recovery of rainwater into a tank, for irrigation of the sandy dune to become a garden. Here the buildings were, almost playfully, renamed “muntrullo” (a composition from word "mundùl" which indicates the traditional round hut with conical roof, and "trullo"). Conditions of the social system in Somalia were very special. The provenance from nomadism to much of the population makes it easier projection towards innovation and adventure. Learning by the workers was much quicker here than in countries with strong rural tradition, but the fastest work resulted in a minor geometrical precision in conical roofs. It clearly emerged the possibility to modify the shape of the trulli, using variations of their slope. This can be achieved with different projections of the courses of masonry, to obtain a great variety of forms, such as that of the "onion-shaped" domes of certain Indian architectures. In Mauritania, in the oasis of the North, would it be possible to start the same experience, since the local round constructions have already stone walls of good texture. The building technique of the walls looks very good and evolved, but the covers are very poor, because made with vegetal material, which in the oases is scarce and of poor quality (lack the long wood and rights required for the base of rooftops warping). In this case, the introduction of the "trullo" technique looks as a significant improvement of a building that has deep roots. Other experimental buildings arose later in other countries, linked to international projects for development. In 1990 in Milan, with the ERASMUS University Project, students of the Politecnico di Milano and of a Belgian University made three types of construction, a short internship at a shipyard Construction Training School: a Byzantine style Dome, a Trullo and a «small Vault» catalana. Between such experiences, we mention the initiative in Niger of PROFORMAR - Projet de formation modulaire en faveur de l'artisanat rural, U.E.- B.I.T.). Since 1995 the construction of "Trulli" was implemented, within the framework of the activities of Woodless Constructions, particularly important in a Sahelian country, where the use of timber for buildings can cause dangerous processes of desertification. 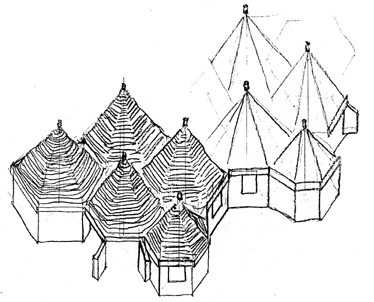 A group of "trullo" buildings made by arch. Arecchi at Mogadishu, for Water for Life. Extensive and promising prospects are open. We may not claim that the "trulli" constitute the panacaea for solving living’s problems in Africa or in the Third World. However, they constitute one of the most valuable innovative solutions, which must be carefully taken into account whenever you address issues related to training in the construction sector and the construction of houses or buildings of low-cost services. It is said that the type of circular or polygonal approximating to the circle, is always the more palatable to populations who until yesterday were living in huts. Often, indeed, in the past there was a harsh rejection of these types of urban inhabitants, for psychological reasons and a desire to "modernity", associated with the urban enjoyment. Today in the third world (especially in Africa) the achievement of economic construction can not contact directly or farming communities or in marginal urban districts, since it involves layers of population living under economic income or self-sufficiency. You can come to the realization of a broad sector of construction quality cost significantly lower than those of the market. In this area the "disinherited", marginal in the economic structure of the city, will be able to find a bin as reealizzatori of new forms of construction. Hope for them is not so much that the possession of a House better than that-more concrete-learn to build homes and other buildings with "cutting-edge" technology, in conjunction with international development projects, so as to become producers of income. The target of their income, choices related to their development, their hopes are almost totally unfathomable to the operator of international cooperation. The only thing certain is that it doesn't pass-not first-through the improvement of their housing conditions. Especially if this "improvement" is interpreted according to the parameters of the European lifestyle, made in Africa from urban bourgeoisies. Rather than responding to an unstated "request for accommodation", the intervention of cooperation for development of the international agencies and other Bodies can therefore develop new materials and new technologies to open up new production possibilities in the Backstreets, having analyzed all local economic conditions, but also after you have identified the scope in the fields of cooperatives and small enterprises.